I recently wrote a story questioning if now was the right time to open a stereo store? The argument was that it's never been easier to become a dealer for A-list brands in top cities than it is right now. Historically, that hasn't been the case; but now, being a dealer for XYZ audiophile brand can be a license to print cash dollars if handled correctly. Readers and manufacturers alike complain about how few "channels" or "pipelines" there are to sell high-end gear, beyond Magnolia. Yes, there's the Internet, but audiophile components often require some sort of demonstration process. Free in-home trials are always a good option, and all Internet brands worth their salt give you a 30-day trial. Still, it's nice to fall in love with an amp or pair of speakers before you buy them. The idea of the audiophile bed and breakfast came to me a few weeks ago. The PGA Tour had overtaken my golf course in February, so my buddy and I migrated a little to the east to play a round of golf at Desert Forrest (which brought me one closer to my bucket-list project of playing at all of the top 100 golf courses in the United States. I'm at 59 of 100, with 19 of the top 20 completed). Before the round, I had breakfast with my old friend Dan D'agostino. He recently moved to Carefree, Arizona, to run his new uber-high-end business. Despite the acrimony from his departure from Krell after 29 years, I haven't seen Dan so content in a long time. My hosts at Desert Forrest were both music lovers and musicians, and I wanted to make the connection between Dan and these Arizona snowbirds. Sadly, Dan doesn't can't do a live demo of his product at the factory like, say, Transparent does. We talked about the benefits of getting a demo system into one of the fancy resorts in Scottsdale--both for the company and the potential client. If you want to make a good decision about which audiophile products to purchase, you need to audition a lot of gear. The stuff can sound different in one room versus another; the more you listen to high-end gear, the more you get an idea of what it can do for you in your room. Audiophiles, just like golf maniacs, are being forced to travel to cities that are still rich with audiophile demo rooms and/or to consumer shows that have dozens of high-end demos--even if only for a weekend. It's becoming increasingly expensive and timely to make a thoroughly informed decision about AV gear, even when you live in a big city like Los Angeles. My argument is, why not buy/create an audiophile bed and breakfast? Pick a quaint location that isn't too crazy expensive and has reasonable access to domestic air travel. Outfit every room with some sort of audio system, with larger systems in the more traveled rooms. I stayed at a hotel called Baker House 1650 in East Hampton on Long Island during a recent golf trip. It's a huge mansion converted into a B&B. In the summer, it's pretty expensive, but it's very luxurious. It's close to the beach, and they make unreal blueberry pancakes. If audio manufacturers and dealers convinced them to install some music systems, they'd have a captive audience of well-heeled people who may never have sat down with a nice martini (they have a very cool honor bar with all of the mixings) and some really great-soundingmusic. People could have private access to audio in their room, as well as listening in more public spaces in the venue. You could take the concept a lot further if you were so inclined. Farm-to-fork food is nice. Live music performances open only to guests could be yet another perk. How about a thumb drive of a mastered, 24-bit performance of a string quartet or jazz ensemble as a parting gift for your stay? Can you imagine having a pair of Wilsons in your suite? Everyone has likely heard the most lauded high-end speakers from Utah at shows and in stores, but how about having the chance to let them lull you to sleep at night? You think that might help people understand the value of great audio in their lives? Where this idea gets diabolical is that attacks the age-old objection of the Wife Acceptance Factor. I am not kidding you when I tell you that I have a clause in my pre-nup that says I can pick any speakers that I want for any location in the house, as I have been so offended by wimpy audiophiles who whine about "my wife this" and "my wife that." I guess some audiophiles are lucky to have wives, but seriously, men, bring your ladies to a romantic bed and breakfast and get them taking cooking classes, doing wine tastings, going skiing, going to the beach--all while you dive into your favorite music without pressure or interruption. Does this sound like a good idea yet? Then I offer a trick to the proprietor of said audiophile bed and breakfast that we used at Cello Music and Film Los Angeles with great success. Since we only had a Manhattan and West Hollywood showroom, if you were willing to travel, we were willing to credit you the cost of travel toward your system. This tick-for-tack value proposition works nearly every time. If you got your stay at the hotel comped as if you were a Vegas high roller, how could your wife complain about you setting up such a romantic trip where she got a shiatsu massage and you got a new tube preamp? Stereotypical audiophiles are getting up there in age, as the hobby was started by Baby Boomers and is still powered by the same demographic. Why not take that retirement plan and invest in your hobby and turn it into a viable if not kickass business? Wives will love it. People who love music will love it. Audiophiles will flip for this inclusive way to present the luxury of the audio hobby over its nerdy points. Get couples and families listening to both live and recorded music in venues that highlight the lifestyle benefits of music, and you've transcended what a traditional audio store can do. 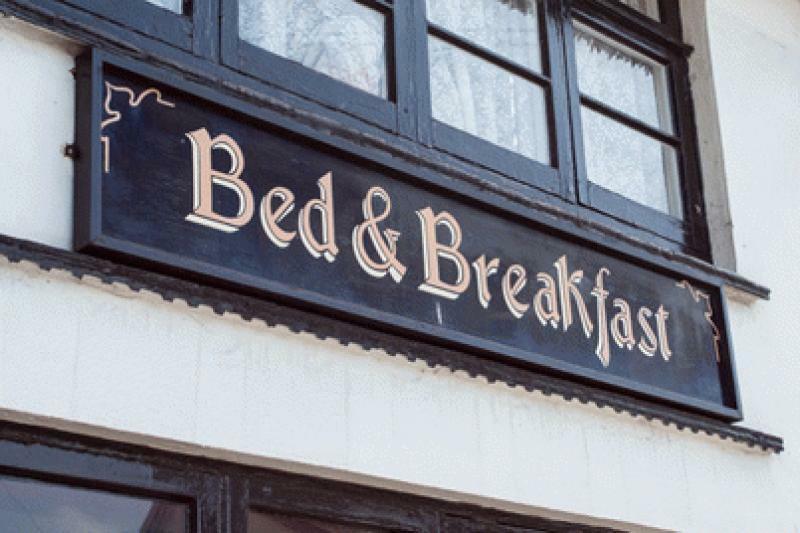 Would you stay at an audiophile bed and breakfast? Should people invest in this idea? How much would a credit for your travel expenses motivate you to invest in your next component upgrade, especially if the B&B had really good, A-list gear? Comment below. We'd love to hear from you. • Fantasy CEO: Saving RadioShack From Bankruptcy at HomeTheaterReview.com.